Posted September 28th, 2011 by Yvonne Hawkey & filed under Amplifiers, Lavardin. 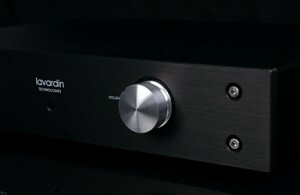 What a breath of fresh air this integrated amplifier is, can making great music really be this easy ? The IS Reference is a star, one of those all too rare products that make you realise how crazy most other amplifier systems are. I thoroughly enjoy watching the bemused looks on their faces as it goes from â€œdoes not computeâ€ to eventually â€œthe penny has droppedâ€. Yes, all that music from one simple box. This outstandingly simple, elegant looking integrated really does make a mockery of the whole multiple box amplification systems that some companies make. Fun, fun and more fun. Once a Lavardin has you in its musical clutches it is very, very difficult to escape from the enjoyment. Album after album, hour after hour, especially via the brilliant MM input that weâ€™ve got fitted to ours.